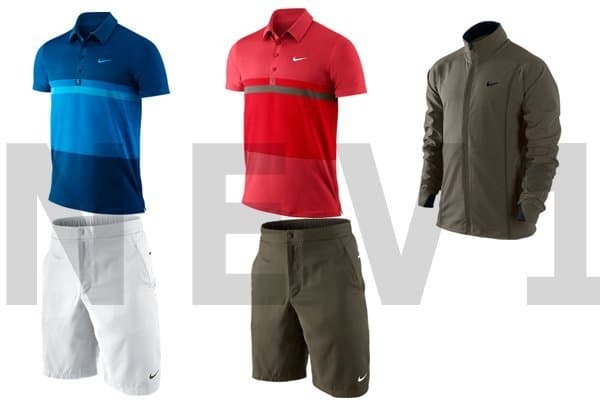 I've just seen some early pictures of Roger's outfit for the Australian Open which starts on 16th January 2012. I'm not sure these are nailed on to be the clothing he's in when he potentially lifts slam number 17, but I reckon it's likely (on both counts). Historically he's worn many shades of blue at the Australian, and seen as though one of these polo's is blue, it does add up. On first glance, I'm feeling both polo + short combinations, but the jacket isn't really impressing me. As shorts, I think the khaki? Olive greeny? colour works pretty well, because the red of the polo offsets it nicely. But as a jacket it looks very drab like something an old man (or Andy Murray) would wear. I'm glad Nike have stuck with the faithful polo shirt though, I've said before, v necks/crew necks are solely for Nadal. I'll update this post if there any more photos or changes to the proposed outfit. Thanks to Nev1 (whoever he is) for the photo. I’m liking that brown Nike jacket – I may have to make a late Christmas present request to Santa! he also seems to have a white and red polo of this design. I’ve not seen it – you got a link to a pic? But Roger never wore the red polo with the khakis at AO 2012 at all. It was always with white. Or did he? At least I didn’t notice.